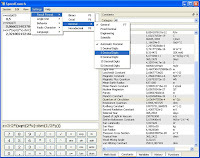 SpeedCrunch is a relatively new name among the calculators, which not only can all that he built into Windows, but it is equally easy to use. The advantage is the fact that they know how to count a lot more complex expressions, unlike other traditional calculator, and have him admit that even though it is a very early release, works extremely fast and stable. Its accuracy will not say much because it either does not have too much sense, but definitely not adapted to those who intend to run up to the financial calculations. Fittest for the school and students and all those who have to calculate complex mathematical expressions. However, it is possible to define how the form should show the result, and even on how many digits should be counted (can count on a maximum of fifty decimal places). Embellishes it very practical interface that roughly mimics the way and have a traditional Calculators. However, when you begin to pluck the menus, you will very quickly find that SpeedCrunch hides much more than w hat it seems. In the first place, accounts phrases as you type them in a small balloon prints the current result which enables easy remaking expression. Although known paint phrases you enter in order to be easily readable, and the color will not be transferred to the bar where the printed results. But it does not matter. SpeedCrunch and very small defects reimburse other very useful features. For example, remember the past hundred entered the expression, and can easily repeat only wring the arrows on the keyboard (there is even a special panel that will be written the history of the term enrolled). Is clever enough to automatically correct the partially entered terms or functions. So you just type in a trigonometric sine function, and you press the enter key, this will automatically enter sin (ans) and give the result. Wondering whether it is at all ans, the answer is simple. This is a variable that has always kept the last result. Variables are still one of the coolest features that has SpeedCrunch. Specifically, in addition to predefined variables such as ans, you can define at will and use them in their terms, while among the variables have their place and found the number pi, and phi. There are many now able to jump in shock, because neither drink nor phi are not really variables, but constants, but they have their place here purely because they found that they were easier to put in an expression, you have the need for it. In fact, SpeedCrunch offers quite a list of the abundant variety of constants that you can also use the terms. Grouped into five categories, and to insert in one phrase, it is enough to click twice on it. Besides a list of constant, is armed and increasing the amount of various mathematical functions. The good thing is th at when you insert function works, and the automatic completion, and will, when writing expressions SpeedCrunch offer possible functions based on a few first letters entered. There is goodness and that all lists can always be shown on the additional panel. Each will be placed on your card, and even they can be, and disagree on request. How is SpeedCrunch quite intuitive and flexible user interface, is really easy to remove, move and hide elements and up to a certain level adjust interface, instead of the taskbar, you can squat in the system tray, and there is a series of keyboard shortcuts, so it is worth using. Among the various panels, you will find one - mathematical book. It is a small library in which the listed formulas 2D/3D objects and one for solving quadratic equations. 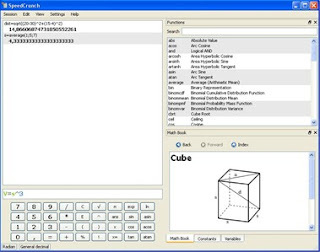 It is not about something too revolutionary, but how in the background of classical HTML file (you will find them in the directory where the SpeedCrunch installed or where it is started if you use the portable version), you can easily add their own pages with formulas so that the panel could not prove quite useful. In any case, SpeedCrunch is a really good calculator and this regardless of what is on his pretty early release. Well-equipped, working quickly, and it is completely free.